Zoroark-GX is undoubtedly one of the best pokemon to play in the Pokemon TCG currently. Its Trade ability is a great way to ensure a steady stream of cards to your hand. 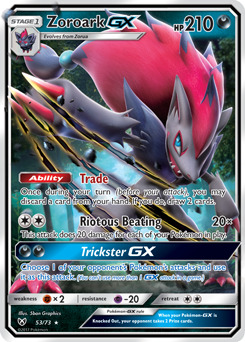 Being able to essentially "trade" the worst card in your hand (by discarding it) in order to draw two brand new cards from your deck allows you to find key Trainer cards you need as well as additional pokemon that you can put onto your bench to help power up Zoroark-GX's Riotous Beating attack. Plus, via the use of specific Trainer cards, the cards you've discarded can potentially still be used. For those reasons, Zoroark-GX is played in a variety of decks. Today, we'll be taking a look at a few of those decklists and discussing some cool interactions within them. The use of Banette-GX in this deck makes it difficult for your opponent to play any new basic pokemon that could be taken down with Banette-GX's Shady Move ability. This ability can also be used to deal the last few points of damage to a pokemon that your opponent has swapped out for one of their benched pokemon. It's a nice way to be able to win a prize that your opponent is powerless to stop. You can do something similar to this with Tapu Lele UPR's Magical Swap attack as well, however doing this will require placing two of your energy cards onto Tapu Lele which can be risky, so it's best to do this as a last resort only. 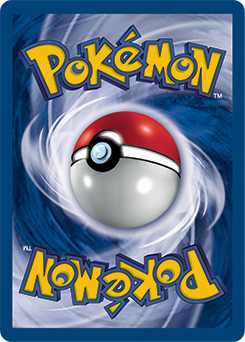 This deck utilizes a lot of the most popular trainer cards. I really like the two copies of Acerola, especially since all of the pokemon in this deck are either basic or stage 1 pokemon. Playing this is a great way to reset a damaged pokemon and prevent your opponent from drawing one of their prize cards. It's also a good way for you to be able to reuse any energy cards that were attached to the pokemon you're returning to your hand, since they now can be placed on other pokemon currently in play. The next version of a Zoroark-GX deck I have for you pairs Zoroark up with Golisopod-GX. Let's take a look at the deck. This deck relies on swapping Golisopod-GX and attacking with First Impression often in order to deal a quick 120 points of damage to your opponent's active pokemon. You can easily switch your active pokemon with a benched Golisopod-GX via the use of Guzma or Switch. Also, since the deck runs a couple of copies of Acerola, you can return your active pokemon to your hand with Acerola and make Golisopod-GX your active pokemon as a surprise move your opponent may not see coming. This deck runs a single copy of Pal Pad which can help you get additional uses out of your Guzma or Acerola supporters. Alternatively you could always use it to return Cynthia or Professor Kukui to gain more access to additional card drawing, but this should be the exception rather than the rule. 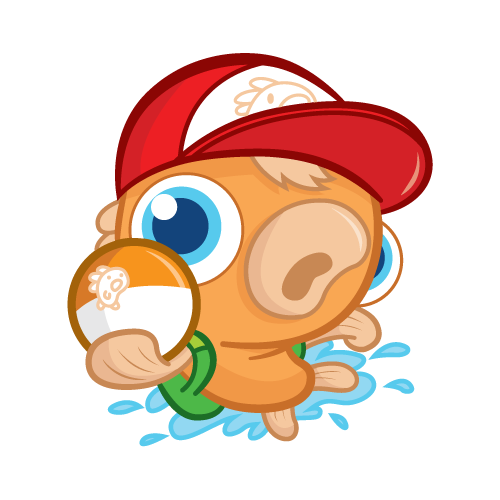 One other card that can help you get more uses out of your important supporter cards as well as help recycle any energy cards that have gone to your discard pile is Oranguru UPR with the use of its Resource Management attack. You likely won't be able to do this as often since it takes away your opportunity to deal damage to your opponent's active pokemon, but it can be useful when times are desperate. The next pairing for Zoroark-GX I have for you is with Lycanroc-GX. Here's an example of this style of deck. This deck shares some of the same cards and interactions as the previous deck I've discussed, so I'll focus on the key interaction that Lycanroc-GX provides. Its Bloodthirsty Eyes ability can allow you to switch out your opponent's active pokemon with their weakest benched pokemon, allowing you to gain a quick advantage in the prize department. It feels even better to do this if you're able to swap in a pokemon that they are building up or one that they sent to the bench because it had taken too much damage and they were hoping to heal it in some way on a later turn. Acerola is a great way to be able to trigger this Bloodthirsty Eyes ability multiple times, so make sure you take advantage of it. The next deck I have for you is the final tournament-tested deck for today. It pairs up Zoroark-GX with Garbodor. Let's take a look at it. The main reason to play Garbodor is the potential to do a massive attack that only requires a single Psychic energy. Trashalanche has the potential to dish out a lot of damage, but it's entirely dependent on your opponent having Item cards in their discard pile. Fortunately, that's not a requirement that's difficult to achieve since most deck play quite a few Items. In fact, this deck plays a total of 19 Item cards, and most of the top decks play a similar amount. Inevitability is the name of the game with Garbodor, as the longer the game goes, the stronger its Trashalanche attack becomes. The final deck I have for you featuring Zoroark-GX is a deck from the forums on pokebeach.com. As such, it's fairly untested and might require changes for it to perform well in your local meta. I think it looks pretty cool, so I wanted to share it with you. Let's take a look at the deck. By pairing Zoroark-GX with Empoleon, you're able to filter through your deck with Zoroark-GX to find your basic Pokemon to fill up your bench in order to attack for a ton of damage with Empoleon. Empoleon also incentivize your opponent to put fewer Pokemon onto their bench so that Empoleon’s Total Command attack isn't as effective, which can really be to your benefit. If I were to make any changes to this deck it would be to add 4 copies of Double Colorless Energy. I would probably take out 4 Water Energy cards to make room for these, although that will definitely affect the effectiveness of Aqua Patch. Aqua Patch could also be removed in order to add a couple of copies of Acerola, a Rescue Stretcher, and a Mallow as well. With those changes, I think this would be a really strong deck. As you can see, Zoroark-GX is a very versatile pokemon and can be included in a variety of different decks. Which of these decks is your favorite? Are there any other pokemon that you think Zoroark-GX pairs up particularly well with? Let me know by leaving a comment below or you can reply to me directly on Twitter (@mikelikesmtg), or email me directly at mikelikesmtg@gmail.com. And be sure to join me here again next week as I continue my search for innovative decks in Standard. I'll see you then!